In the pre-52 Universe Batman went up against the Suicide Squad four times, and on each occasion, he learnt something about them he didn't think he would. Firstly, he came to the realization that not everyone could go 'Up Against The Wall'. Then, both he and the Justice League figured out that both teams have an awful lot in common. On their third outing together, Batman, Superman, Aquaman, and the Squad, went in search for the Atom. And finally, on their forth meet-up, Batman helped resurrect the team in 'The Phoenix Gambit'. Now he wants to give it one more shot, and he's bringing along with him Tom King, Mikel Janin, and DC Comics. It's November, 2016, and it's time for the Batman double-review. TO QUOTE Leila Janah: 'True leadership isn't about having an idea. It's about having an idea and recruiting other people to execute on this vision'. Have you ever watched the classic 1967 war-time drama, 'The Dirty Dozen'? If so, then you may remember a scene at the start of the film where Major John Reisman, as played by Lee Marvin, is walking through a prison, one cell at a time, and selecting his recruits to help him take down the Nazi bad-guys. 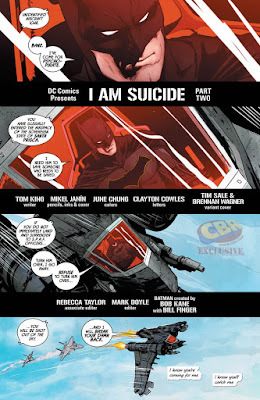 Well, basically that's what we get with issue 9 of Batman, also known as part one of 'I am Suicide', where we see Batman strolling through Arkham Asylum and selecting members for his team. The Ventriloquist, real name Arnold Wesker: Initially I thought this version of the character had been replaced by a female version, but hey, nice to know he's back again, although I'm not quite sure what he can bring to this particular gang of misfits. The same can also be said for some of the other characters Batman recruits, such as Kite Man (Ouch?! ), Mayo (Who? ), Dum and Dee (Good henchmen, but yuck), the Calendar Man (he must have gotten himself sacked from the New 52 TV show), plus on top of that, there's Jane Doe (Was that a Legion of Superheroes logo she drew onto her cell window? Wink-Wink!). On the flip side of things, however, there were some great members recruited by Batman as well. The first of which is one of my all time favorites, Bronze Tiger, real name Ben Turner: who was one of the original members of the Suicide Squad when it was penned by John Ostrander. From the looks of it, it's as though Ben's been retconned again during Rebirth, and this time doesn't seem to have any prior knowledge of him fighting Red Hood or working for Ra's Al Ghul (As seen in the first series of Red Hood and The Outlaws). I say presumably retconned, as he did seem quite chummy with Batman, especially during their quick sparring match together. After Ben, Batman's penultimate recruits are two other members from the John Ostrander version of the Suicide Squad. Punch and Jewelee, real names unknown, who are basically light weight version's of the Joker and Harley Quinn; and in some way were their Squad counterpart's many years before they were introduced to the team. Even though both of these characters are far sillier in temperament and tone, and far less popular by default, P and J are a welcome addition to Batman's team, if only for their down to earth natures and their real world sensibilities. Now at the end of the issue Batman recruits Catwoman. Yes. I said Catwoman. A sudden surprise that leads us now onto issue 10, also known as part 2 of 'I am Suicide', as its here where we take an abrupt departure from Batman's suicidal recruitment drive. At the start of the second episode we see Batman flying a plane over Santa Prisca, trying his best to penetrate Bane's kingdom and confront him about the Psycho Pirate. While this is going on, at the same time there's another element added to the mix, a letter, a heartfelt letter addressed to Bruce, written by an orphan who tells him that they can always remember Bruce's face when they stayed at an orphanage financed by his parents. Of course, I can't give you too many details about what this letter actually says. Yet the one thing I will say, is that the writer of this letter isn't the person who you may initially think it is. Also, to a certain extent, you can say exactly the same thing about how this adventure pans out. Conceptually we see Batman fight, get captured, and try to escape from Banes stronghold. But the way in which he manages to do this asks the all important question... why the f*ck does he need the help of the Suicide Squad if they're nowhere to be seen? Maybe this question will be answered next month, which I'm sure it will, yet in the meantime this was a bit of a loose thread, story-wise. Another thing I wasn't too sure of was the way in which Batman kept on repeating the same piece of dialogue throughout the entire issue, almost as if it were some sort of mantra. Is it just me or doesn't this seem weird? Not in a bad way of course. In an unexplained way, which, I must confess, is the only negative thing I can say about these two installments. Apart from that, everything else was just amazing. Mikel's art was both detailed and had a nice bitter edge to it. Tom's story was simple on one level yet extremely intense on another. And all in all, a great start to what seems to be a great epic. Viva La Batman. Viva La Squad. There was something I failed to mention about issue ten in my review, so, to give you a hint as to what that something was, here, check out this song sung by Jay Sean. I think I've answered this question already, haven't I? 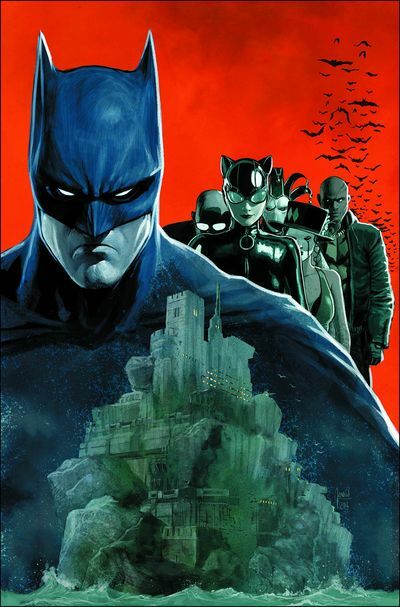 At the start of my review I compared issue nine of Batman to a scene in the film, 'The Dirty Dozen'. Here, check it out and tell me if you agree. Oh, Chase me. Chase me. At first I was afraid, I was petrified. Kept thinking I could never live without you by my side. But then I spent so many nights thinking how you did me wrong. And I grew strong, and I learned how to get along. Oi John, got a new motor? Hey, I just met you, and this is crazy. But here's my number, so call me, maybe! 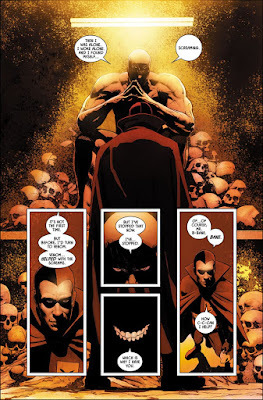 Bane, I've come for Psycho Pirate. I need him to save someone who needs to be saved. Turn him over, I go away. Refuse to turn him over, and I will break your damn back. No-No. No-No, No-No. No-No, No-No. No-No, there's no limits.